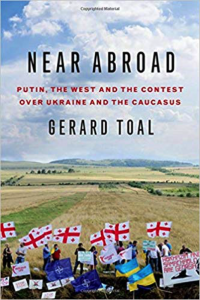 In Near Abroad, the eminent political geographer Gerard Toal moves beyond the polemical rhetoric that surrounds Russia’s interventions in Georgia and Ukraine to study the underlying territorial conflicts and geopolitical struggles. Central to understanding are legacies of the Soviet Union collapse: unresolved territorial issues, weak states and a conflicted geopolitical culture in Russia over the new territorial order. The West’s desire to expand NATO contributed to a growing geopolitical contest in Russia’s near abroad. This found expression in a 2008 NATO proclamation that Georgia and Ukraine will become members of NATO, a “red line” issue for Russia. The road to invasion and war in Georgia and Ukraine, thereafter, is explained in Near Abroad. Geopolitics is often thought of as a game of chess. Near Abroad provides an account of real life geopolitics, one that emphasizes changing spatial relationships, geopolitical cultures and the power of media images. Rather than being a cold game of deliberation, geopolitics is often driven by emotions and ambitions, by desires for freedom and greatness, by clashing personalities and reckless acts. Not only a penetrating analysis of Russia’s relationships with its regional neighbors, Near Abroad also offers an analysis of how US geopolitical culture frequently fails to fully understand Russia and the geopolitical archipelago of dependencies in its near abroad. Gerard Toal is Professor of Government and International Affairs in the School of Public and International Affairs at Virginia Tech’s Washington metro area campus. 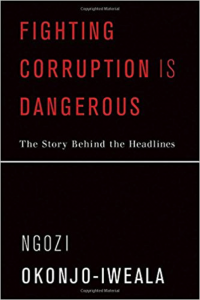 Ngozi Okonjo-Iweala has written a primer for those working to root out corruption and disrupt vested interests. Drawing on her experience as Nigeria’s finance minister, she provides a frontline account of the dangers, pitfalls, and successes in fighting corruption. Okonjo-Iweala details the numerous ways in which corruption can divert resources away from development, rewarding the unscrupulous and depriving poor people of services. Okonjo-Iweala discovered just how dangerous fighting corruption could be when her 83-year-old mother was kidnapped in 2012 by forces who objected to some of the government’s efforts at reforms led by Okonjo-Iwealaâ€•in particular a crackdown on fraudulent claims for oil subsidy payments, a huge drain on the country’s finances. The kidnappers’ first demand was that Okonjo-Iweala resign from her position on live television and leave the country. Okonjo-Iweala did not resign, her mother escaped, and the program of economic reforms continued. “Telling my story is risky,” Okonjo-Iweala writes. 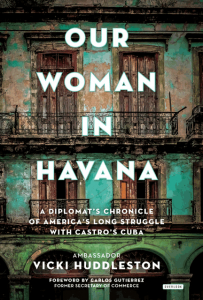 “But not telling it is also dangerous.” Her book ultimately leaves us with hope, showing that victories are possible in the fight against corruption. Ngozi Okonjo-Iweala was Nigeria’s Minister of Finance from 2003 to 2006 and from 2011 to 2015, and Foreign Minister in 2006. She was Managing Director of the World Bank from 2007 to 2011, overseeing South Asia, Europe, Central Asia, and Africa, and is currently Senior Adviser at Lazard and Board Chair of Gavi, the Vaccine Alliance. She is the author of Reforming the Unreformable: Lessons from Nigeria (MIT Press). And not just fascinating, but also instructive. 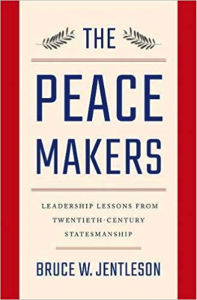 Jentleson draws out lessons across the twenty-first-century global agenda, making clear how difficult peacemaking is, while powerfully demonstrating that it has been possible—and urgently stressing how necessary it is today. 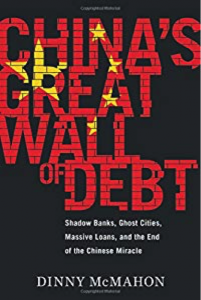 McMahon shows how, lurking behind the illusion of prosperity, China’s economic growth has been built on a staggering mountain of debt. He goes beyond the headlines to explain how waste has been allowed to flourish, and why one of the most powerful governments in the world has been at a loss to stop it. DINNY MCMAHON spent a decade in China as a journalist covering the Chinese economy and financial system for the Wall Street Journal and for the Dow Jones Newswires. A native Australian, he is fluent in Mandarin. McMahon completed China’s Great Wall of Debt while a fellow at the Woodrow Wilson International Center for Scholars in Washington, DC. He is currently a fellow at MacroPolo, a China-focused think tank based in Chicago. Since the World War II, Thailand has positioned itself as a key strategic ally of the United States, serving as a bulwark against communism in Southeast Asia and as a base for American troops during the Vietnam War. 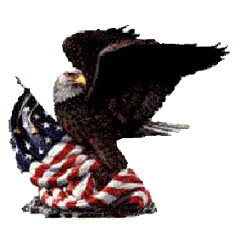 In return, the United States has provided millions of dollars in military and economic aid. However, recent decades have seen a striking reversal in Thailand’s foreign relations, with China, once a sworn enemy, now treated as a valued ally by the Thai junta. This shift reflects China’s growing status as a world power, and it represents a major setback to American efforts at curbing the spread of Chinese influence in Asia. It has also had a dramatic impact on Thailand itself, as the country’s ruling elite seek to follow the Chinese model of authoritarianism combined with neoliberalism. In this up-to-date study of Thai foreign policy, Benjamin Zawacki provides a compelling account of Thailand’s modern history and its changing role in the world order, from the beginning of its alliance with the United States in 1945 to the 2014 coup and beyond. Featuring extensive interviews with more than seventy high-level figures in Thailand and the United States, including deposed prime minister Thaksin Shinawatra, the book offers unprecedented insight into the inner workings of the Thai elite and their dealings with the United States and China. 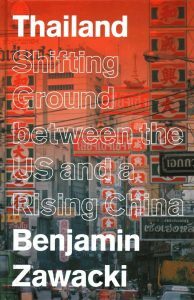 As the Sino-American rivalry escalates, Southeast Asia will become an increasingly important theater in global affairs. Understanding the current transitions of power in Thailand are essential for comprehending the profound implications of China’s influence, not only for the region, but for the wider world. Benjamin Zawacki was a visiting fellow in the Human Rights Program at Harvard Law School in 2014-15, and a term member on the Council on Foreign Relations through 2016. He was Amnesty International’s Southeast Asia researcher for five years, and served as a policy advisor to President Jimmy Carter and two other “Elders” in Myanmar. 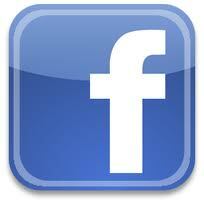 A regular contributor to the media in Southeast Asia, he has lived in Thailand for 15 years. 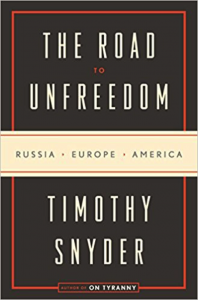 In this forceful and unsparing work of contemporary history, based on vast research as well as personal reporting, Snyder goes beyond the headlines to expose the true nature of the threat to democracy and law. To understand the challenge is to see, and perhaps renew, the fundamental political virtues offered by tradition and demanded by the future. By revealing the stark choices before us—between equality or oligarchy, individuality or totality, truth and falsehood—Snyder restores our understanding of the basis of our way of life, offering a way forward in a time of terrible uncertainty. U.S. Counterterrorism examines the “war on modern terrorism,” from the Nixon administration to the early stages of the Trump administration. The book describes the evolution of U.S. counterterrorism responses to the changing terrorist threats, from primarily secular groups, to those with broad-reaching fundamentalist religious goals such as ISIS. 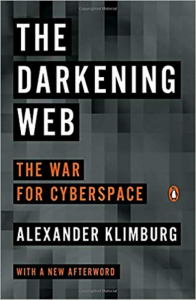 The authors highlight the accelerating rate of changes in the terrorism situation from modern technology; the internet, “lone wolf” terrorists, cyber threats, and armed drones. 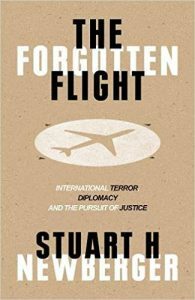 The book describes the Bush Administration’s dealing with terrorism as an existential threat and a Global War on Terrorism following 9/11. It then discusses how the Obama administration both continued and modified previous policies. The book provides an extensive list of key documents for those interested in the original texts and a discussion of legal issues. 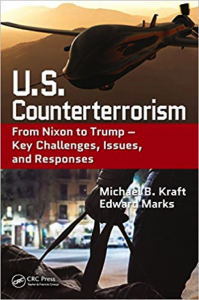 Michael B. Kraft is a Washington-based counterterrorism consultant, writer and editor with more than 30 years of experience working on terrorism issues in the State Department, Congress and the private sector. 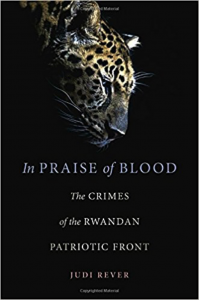 After retiring as a senior advisor in the State Department Counterterrorism Office, he worked on counterterrorism issues at the National Defense University Africa Center for Strategic Studies. Edward Marks served as a Senior Foreign Service Officer (Minister-Counselor) prior to his retirement in 1995. Ambassador Marks was recalled to active duty in 2002-5 to serve as the Department of State’s advisor on terrorism to the United States Pacific Command. Since then he has concentrated on writing, speaking, and consulting, mostly with the Department of Defense.